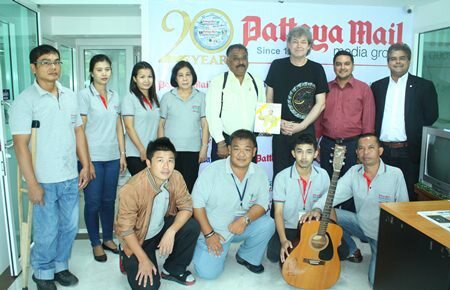 Popular German guitarist Hucky Eichelmann, known as the “Musical Ambassador between the East and West” and closely associated with the music of His Majesty the King, visited the Pattaya Mail Media office on Monday the 16th of September. Hucky has been resident in Asia for 33 years, most of that time spent in Thailand, and during his time here he has fallen in love with the musical compositions of His Majesty the King, transposing many of them so that they could be played on the guitar. Hucky has now been playing music and entertaining audiences around the world for over 40 years. 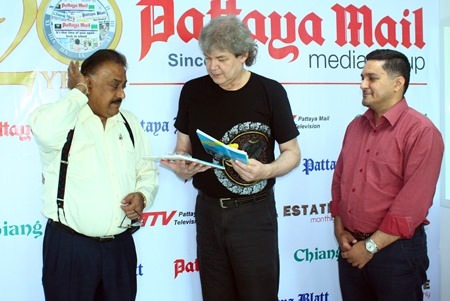 Pattaya Mail Media Group Managing Director Pratheep “Peter” Malhotra (left) and General Manager Kamolthep “Prince” Malhotra (right) present Hucky with commemorative books honoring HM the King of Thailand. Hucky has transposed many of His Majesty’s musical compositions for the guitar. During the interview Hucky spoke about his current tour around Thailand and said that he likes to invite students from local universities, where they have a strong musical department, to join him on the stage and perform at his concerts. Hucky Eichelmann (standing 3rd right) poses for a photo with Pattaya Mail Media Group management and staff during his courtesy call to the office on Monday, Sept. 16. He added that his repertoire is very international and varies from Bach to disco and includes many Asian compositions. Hucky explained that he regards his music as being a great way to promote peace and create a meaningful way of life. Before the interview ended, Hucky had some good news for his local fans here as he mentioned that there will be concert in Pattaya coming up soon, if not by the end of this year then certainly by the beginning of next. 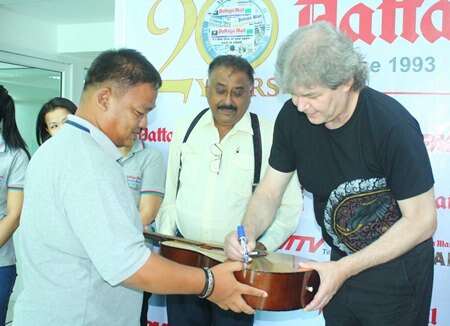 Hucky autographs a guitar for head graphics man, Thanawat “King” Suansuk.